Above are most of the magazines we surveyed. September issue mania ensued chez moi last Saturday with BFFF* Karen. In a highly productive four hours, we visually consumed and discussed fifteen different September fashion magazines. Our selection weighed in over thirty pounds for a total of over five thousand pages of ads, trends, fashion editorial, do's and don'ts and proclamations of what's in and what's out. We learned our lesson from our first session two years ago and did preparatory homework by dividing up the issues a week before and bookmarking what we liked and compiling our discussion points before we got together. We take this seriously. Seriously. What follows is our take on looks we thought would be possible to affordably add to our wardrobes, what looks we could create with what we already have, what we loved just because and even a little DIY (Karen is very crafty). The trends we noticed: fur, feathers and fringe. One could add a lot or a little. But a touch of any of the three f's looks new. And there are lots tailored looks with ladylike details such a top-handled bags, silk flower corsages and gloves. And flats! After a few years of four-inch plus heels, flat shoes are on the models. (However, just because a shoe is flat, does not mean it is urban-street worthy). And coats, which is great for San Francisco. Lots of coats in bright solid colors, bold prints, double-breasted or bathrobe style. A cool looking coat adds instant dash. Long and lean looks good for Fall. In the right proportion, it could work on anyone. The sleeveless coat is a new option. Again, it's a long, lean and tailored look. Prada and Max Mara showed skinny scarves which is an easy look to duplicate. In fact, all the scarves featured for Fall are a little smaller. Beautiful leather gloves in great colors. Here's a DIY look that caught Karen's eye: fake fur muff. Another DIY idea, a silk flower collar adds a pretty detail to an outfit. Our favorite fashion spread was in Vogue, "Dark Horse" shot in Peru by Mario Testino and edited by Tonne Goodman. The above is not an outfit that either of us could wear, but we sure do love it. And I do love this Bottega Veneta skirt. Black turtleneck, great flattering skirt, boots and bold cuff? I could do that! Interesting to note that most of the looks we ripped out to save came from trusty Vogue. I recently received an envelope full of newspaper and magazine clippings from my Aunt Mary Ellen in New Orleans. We fondly call these "Hank mail" after her father who was famous for sending correspondence filled with odds and ends to recipients around the world. Once you were on Hank's mailing list and he knew your interests, you received missives from him for life. In ME's envelope was the above clipping, which gave me a laugh. Even for those of us who worship at the altar of fashion, what we consider good taste is often pushed beyond the limit. The above bag was shown at Chanel's once-a-year Metiers d'Art (also known as Pre-Fall 2014) which took place in Dallas last December. 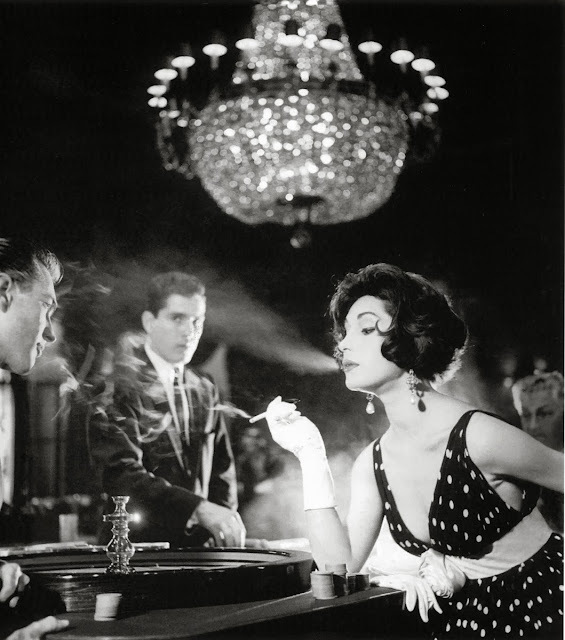 Karl Lagerfeld chose a Texas theme to honor Dallas and Neiman Marcus, the first place to enthusiastically accept Coco Chanel's comeback designs in 1957. For context, it's good to know a little history here. In 1939 Chanel closed her salon when France declared war on Germany. Following the war, Chanel observed Dior's success with the "New Look" and felt the tiny waists and full skirts were not modern at all. She reopened her salon, but her designs were not a critical success. 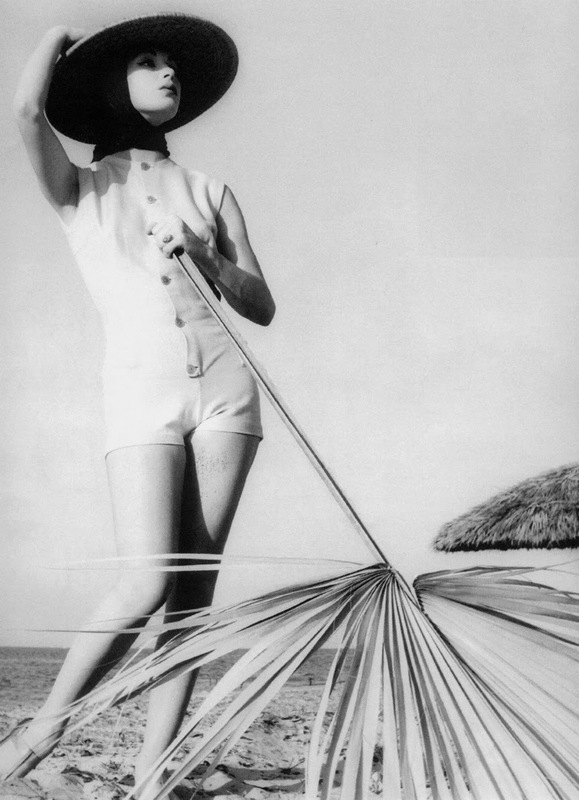 She soon developed the Chanel suit that we know of today: tweed fabric, braid trim, short boxy jacket and narrow skirt. America, especially the Dallas-based Neiman Marcus, accepted her modern suit with great enthusiasm. For Pre-Fall 2014, Lagerfeld went a little Texas-happy applying western motifs to everything. ME and I chatted about this the other day and she had more to add: "It's not Chanel anymore. I'm old school. I'm glad he's kept Chanel going but I wish she was here. I'd love to hear what she would say. The bag looks like Texas and not Chanel. I don't think you'll see it on the Rue St. Honore or Boulevard St. Germain. A touch pricey I think, but maybe a horse comes with it. Quel disappointment." I stopped by the San Francisco Chanel boutique last week to see the handbag in person. There were about five or six variations of the "saddle" bag with lots of fringe and trim, beaded jewelry items with a Native American theme and a red, white and blue silk scarf with a large "Dallas" printed on it. The items didn't feel San Francisco at all, but the shoppers are tourists from other places in the world, where a western theme is probably considered exotic. But for locals, the Texas style is too close to home to take seriously. For the Texas show, he directed a 24-minute video about this time in Chanel's life. Called The Return, it is great glamorous fun to watch. 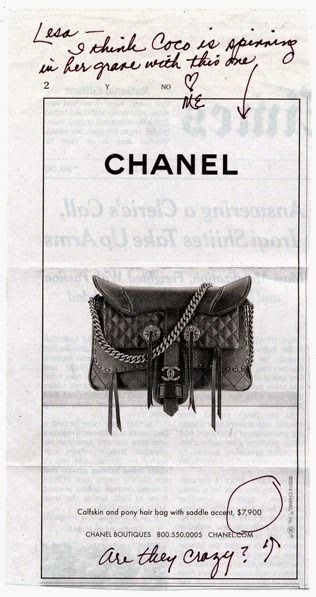 Lagerfeld has a million ideas and I'm hoping the next collection gives me the ol' Chanel coup de coeur. Weighing in at over three pounds, my 2012 selection of September issues. According to the American Family Scale, it's more than a bunch of bananas, but less than a chicken. It's that time...the September issue Olympics. As a magazine and fashion lover, this is both exciting and daunting. It's no longer the September issue, it's issues. 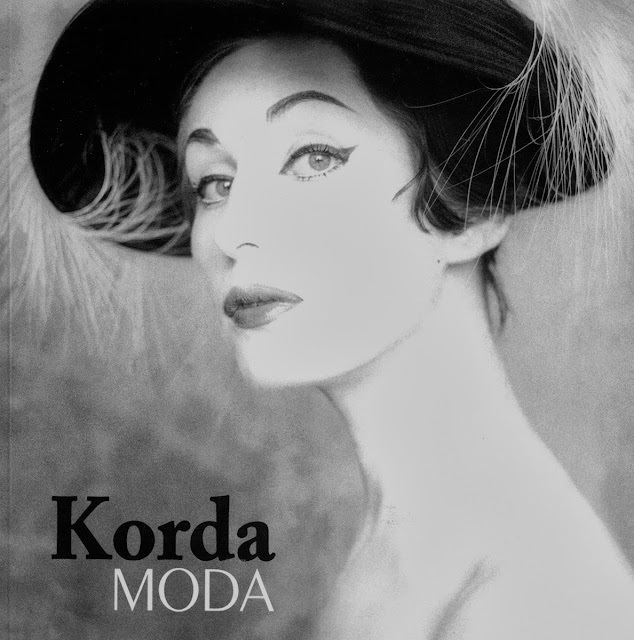 At one time, Vogue was the only September issue that was fat with ads, fashion photos and editorial. I could leisurely flip through the pages and when I eventually reached the last page, I was confident that I knew what I needed to know about what was new for fall. Now all the fashion and style mags across multiple categories are on to the extra ad revenue and cache. For style and culture hunters, there's now at least fifteen magazines to study. Two years ago, my BFFF (best fashion friend forever) Karen and I decided to tackle the project together. We began at about 10 am on a Saturday and it took us until early evening to dissect our collection of September issues. We read, sticky-noted, ripped out pages, highlighted, discussed what worked and what didn't until we couldn't see straight. It's a job and we're just the girls for the job. We started with breakfast treats, moved on to lunch, then afternoon coffee and finished the day with a martini made by hubby Matt. And of course, we stayed hydrated throughout with lots of water. It was a marathon after all. We missed our session last year so Karen and I have already set our date for our September 2014 issu-athon. I've already received my September Vanity Fair and Harper's Bazaar (with the lovely granddaughter of Audrey Hepburn photographed by the grandson of Richard Avedon). I've done my due diligence in scouring them both and placing sticky notes on various pages for discussion with Karen. Vogue has yet to kerplunk it's big bad self in my mailbox. But I just experimented with a new experience. I got an email from Vogue saying the iPad version was available. I downloaded it and flicked through the first third. It was fun in a novel sort of way, but I felt like I was cheating! I'm saving the rest for the real deal. But the iPad does illuminate all the rich fall colors in the photos beautifully. I did make note that long skinny scarves are in. I like that a lot. I do have a perusal process. As I flip through the mags I ask myself: What's really new? What catches my eye? What elements of an outfit do I already have? Which ones do I want to add? Are the proportions new (wider pants? shorter tops?)? Most of the outfits are in the multi-thousand dollar range, so chances are slim that I'll buy that exact Prada item. But how can I translate what I like into something I can afford (and still give the appearance of expensive elegance)? As a pre-game warmup, I just watched The September Issue film again. It's enlightening to hear the creative discussions and see the passion, angst (especially Grace Coddington!) and focus (especially Anna Wintour!) to put Vogue together. I so appreciate all the work, thought and creative mastery that it takes to create a world of beauty, exoticness and elegance all in one package and have it delivered to my doorstep and my iPad. I'll report back on our findings from our upcoming session. And I'd love to hear your thoughts on your favorite September issue this year, whatever magazine that may be. Have you ever used your lipsticks down to the very bottom? Below the rim, there is about a third more product left. Depending on how much I like the color or the price of the lipstick, I've found various ways to use it all. I've used an old lipstick brush that I didn't like very much (the brush was too small) or my finger or any implement I found on my makeup shelf to dig it out, like the opposite end of a pair of tweezers or a makeup spatula. But none of these methods were very satisfactory and I ended up throwing the lipstick out. Or saving it if it was MAC because if you return six used MAC lipsticks, you get one free. But that takes me a couple years. I remember my grandmother, Bootsie, always using a lipstick brush to get to the bottom of her Merle Norman lipstick. Merle Norman! Does anyone know about that brand anymore? Bootsie had a collection of small gold Merle Norman lipsticks that looked antique to me at age eight. And she might have had them for twenty years because she bought lipstick refills so she could use the gold tubes over and over. It would be great if brands did that today. I have some gorgeous YSL lipstick cases that I would love to refill. But I can't, so they become either clutter or landfill. My collection of used lipsticks recently got large enough that I decided to get serious about using them up. I bought a lipstick brush from Sephora for about $12 and I liked it very much until one morning I was in a hurry and pulled too energetically on it and it came apart in four impossible to reassemble pieces. I bought a new one at MAC for twice the price, but the quality is better. I asked the woman at MAC if she uses up the entire lipstick. She does and her method is to scoop it out with small makeup spatulas and put it in little MAC sample jars. She kindly gave me a few to do the same. I've done this before. It's a method I learned from my Aunt Caryl, daughter of my Merle Norman grandmother. She mixes the remainder of several tubes into one small container. This works if all the colors are similar. Once I mixed some red tones with brown and that did not work. It's time for a new lipstick design. One that comes in a beautiful case, can be easily used to the very bottom and then refilled. Who should we call about that? I've written about the fabulous magazine Flair before here. Published by Fleur Cowles from 1950 to 1951, it was arty, intelligent and cultural without being pretentious. Every so often, I pull out a an issue and carefully turn the fragile sixty-four-year-old pages and I always find inspiration. My friend Karen loaned me her collection of the original magazines over two years ago, and I confess I still have them. Karen, I promise you'll get them back! But in a few months, I'll have my own reference book. A rare book of the issues, The Best of Flair was originally published in 1998, and I just discovered that it will be reissued this September 2nd and I just pre-ordered a copy. Yesterday, I was looking through the February issue and saw the above ad. I like the sentiment in the handwritten note: "I believe that to-day as always smart women dress only in terms of their own likes, looks, lives. Sophie"
So who was Sophie? 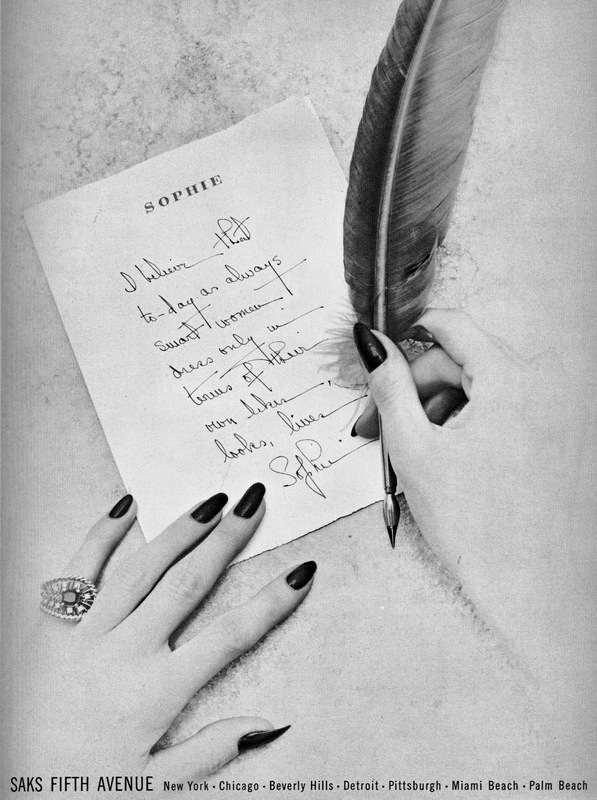 I did a search for Sophie and Saks Fifth Avenue and quickly learned that it was Sophie Gimbel. I didn't know about her before. 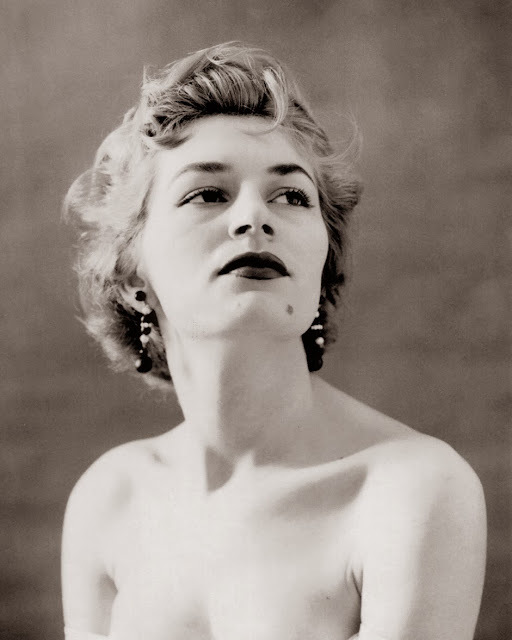 Not well-known today, she was a top American fashion designer for 40 years from 1929 to 1969 and the director of Salon Moderne at Saks creating made-to-measure couture clothes. She was also a smart business person, recognizing a merchandising need when she saw one. When the Paris salons were closed during WWII, Sophie created the American version of couture clothing at the Salon Moderne. 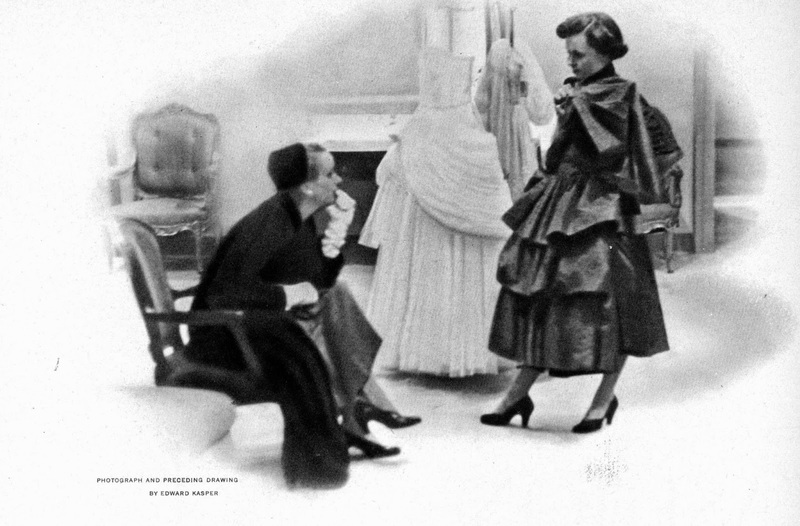 Sophie and Adam Gimbel in 1935 and an evening dress designed by Sophie in 1952. 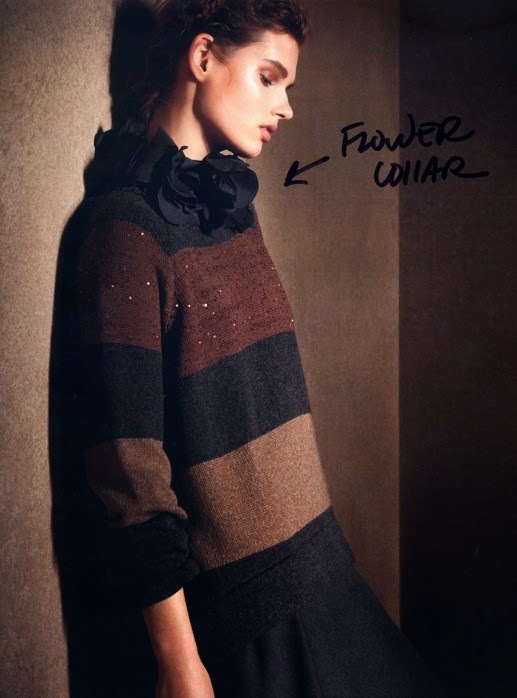 Saks Fifth Avenue Archive: Julia Noni for Saks Fifth Avenue, Parsons Fashion Archive. "I like my wardrobe simple, correct, perfect in every detail." "A woman and her waist should never be separated." "You don't have to have lots of clothes in order to be chic. But you most certainly have to have the right clothes." 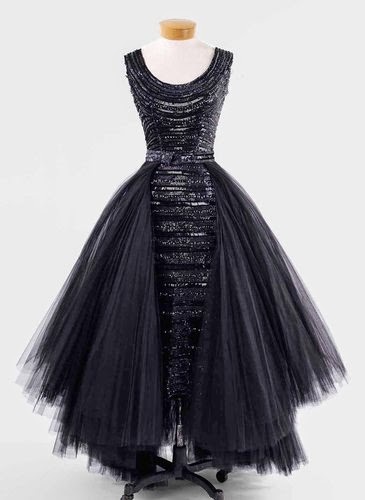 An evening dress from 1958 designed by Sophie Gimbel. Wouldn't it be fabulous to wear today? 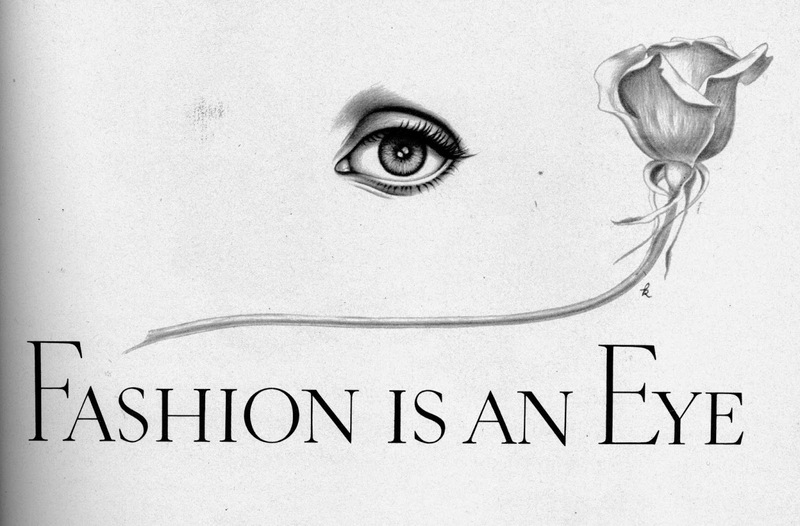 Photo is from the The New York Times, January 17, 2013, by Lolly Koons/Parsons Fashion Archive. In early 2013, Parsons the New School for Design had a show, Sophie Gimbel: Fashioning American Couture exhibiting eighteen of her designs from the Parsons Fashion Archive. I would've loved to have seen that. I'm so glad to learn about Sophie. And it's interesting how an ad that's over half a century old is still piquing curiosity. 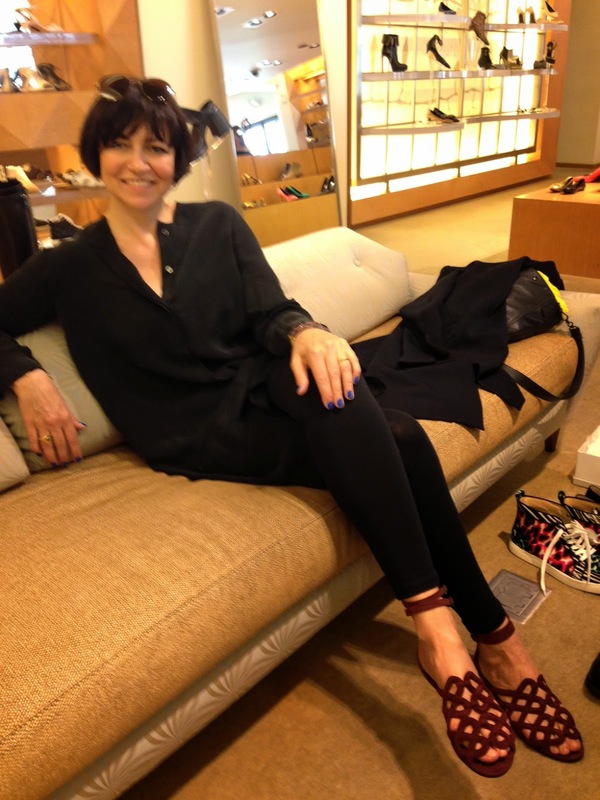 Judith lounging in Azzedine Alaïa sandals at Barneys, wondering "should I?". They look so perfect and easy on her, of course she should and did. "Leeza, it's so eeezzzy." So says Judith, my fashionable designer friend on a recent visit from Germany. She has a quick design eye sharpened by experience and a love for visual pleasure. Judith can walk into a clothing store, art gallery, furniture store or flea market and zero-in on the one thing that exhibits qualities of good design. When it comes to clothing, Judith embodies effortless chic; anything that has a beautiful shape or texture and elegant material and that one could wear with sublime ease is for her. She's a good inspiration and shopping partner. We took an afternoon during her stay to visit a few of the Union Square stores. I'm photographing Judith trying a second pair of Alaïa sandals. These gold-studded raffia sandals were also irresistible. Judith says she plans to wear these for the next ten years. 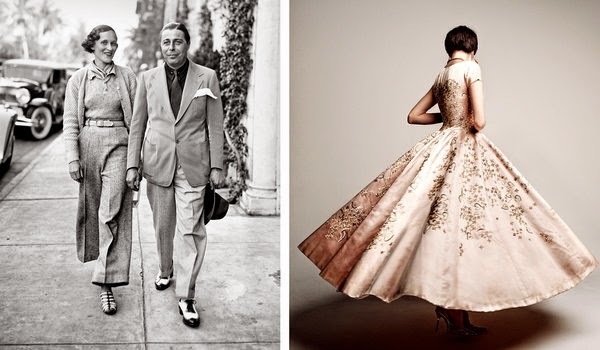 They are so timeless and chic, I'm sure she will. At Prada, the tropical-themed wallet from the Spring Summer 2014 collection called to Judith. Funny, it's a sophisticated version of a souvenir wallet one would buy when vacationing as a kid. She says it makes her smile, as all souvenirs should. I found a couple of great things at Zara. Talk about easy! 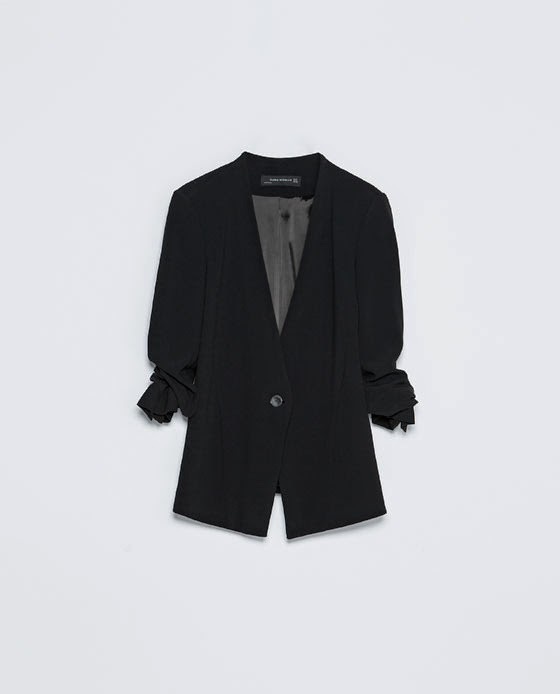 Above is my new Zara blazer. The sleeves are permanently tszujed. You know how often you want that casual dressing-like-a-french-woman look and you keep pushing up your jacket sleeves, but they keep sliding back down? Not with this permanently cool jacket! Perfect for work and after work. 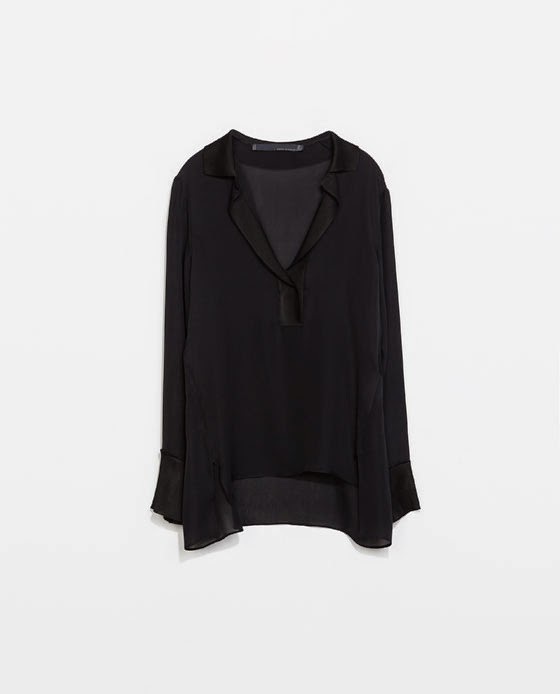 And this Zara blouse is another easy addition. Sheer enough to make it dressy, and long enough to wear casually over skinny jeans. Thanks to Judith, eeezzzy (and elegant) is my mantra when shopping. 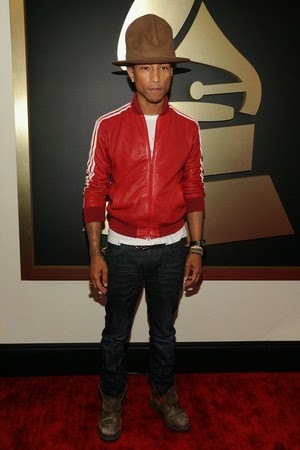 You've probably seen this photo of Pharrell Williams at this year's Grammy Awards. Sometimes I enjoy pushing my look a bit by wearing shapes, patterns or colors that are a little exaggerated and unexpected. I do this intentionally because I like to think it gives people pleasure to see something that's more visually exciting than the norm. And it adds fun to my day. Especially since I work in a corporate office, it doesn't take much and it adds some spark to my day to play with that. Most of the time the reactions are positive and if they're not, that's fine too. I love to see other people pushing the style envelope. Like Pharrell when he wore the Vivienne Westwood hat to the Grammy's. At first glance, it is a bit ludicrous. But when looking closer, one can see that the shape and proportions were created by an expert designer. And Pharrell wears it with such aplomb that he makes it work. It caused a huge social media reaction, crashing the grammy.com site. 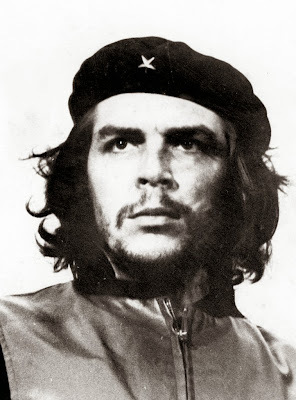 Isn't that funny, that today when we see so many images of celebrities wearing extreme Lady Gaga styles that a hat, just an artistic and sculptural hat, can cause such a flurry? I like that. These Balenciaga shoes cause a reaction everytime I wear them. I fell in love with them when I saw them on the sale shelves at Barney's. Nicolas Ghesquiére took a basic black pump and arted it up with a swath of textured leather and added a sculptural detail to the heel. When I wear them, someone usually asks if they can try them on. When I'm not wearing them, I like to keep them out on a shelf because I enjoy looking at them. And that's a big point. When wearing something extreme, it needs to be something that you sincerely love and that makes you feel good wearing it. On a foggy San Francisco day, wearing this coat makes me happy and the smiles I see on people as I pass them on the street leads me to believe that it makes them happy too. When I first wore it to work, my UK-born boss, looked up from her desk and said, "My, that's a jolly jacket!" Which made me laugh and now that's its official name. Because the pattern is so bold and memorable, I don't wear it that often. But I have fun with when I do. And I always think, since we have to wear clothes everyday, we might as well have some fun with what we wear and give others a little fun too.